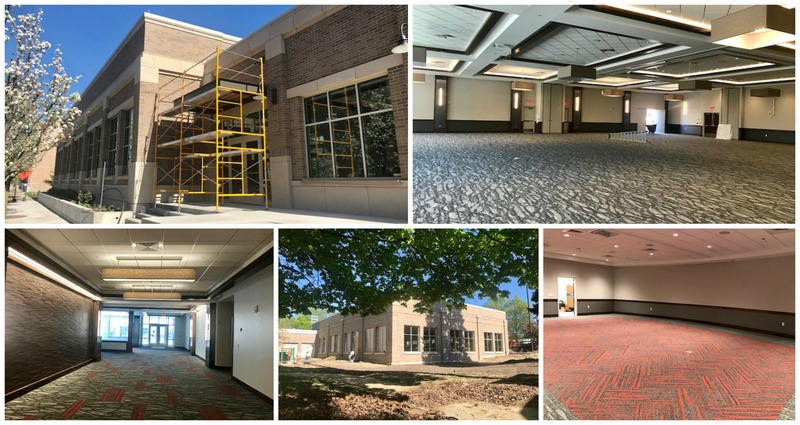 Traverse City’s Park Place Hotel will debut its brand-new conference center next week – a multi-million dollar project expected to bring a major boost in tourism and business traffic to downtown. Facility upgrades also include a new pool and fitness center, as well as room renovations throughout the hotel. The Ticker received an exclusive sneak peek of the expansion ahead of the center’s planned opening next Friday (June 1). Crews demolished the historic dome attached to the State Street hotel last August to make way for construction of the new state-of-the-art center featuring a 7,800 square-foot main conference room. The room can accommodate more than 1,600 guests standing and 500 seated at tables, increasing the venue’s capacity by 60-70 percent. In addition to technology upgrades like expanded WiFi, integrated projection, professional sound and lighting systems, and energy-efficient mechanical systems – not to mention improved room acoustics, a challenge that plagued the former circular dome – the new center can be customized to accommodate a variety of group sizes. Blending between the old and new was also an important principle that influenced the brick-like exterior appearance of the conference center, as well as a replacement building on the southwest side of the property housing a new hotel pool and fitness center. The aesthetic is meant to seamlessly integrate with the Park Place and surrounding properties. “It looks like it has always been here,” says Park Place General Manager Amy Parker. Crews this week were busy pouring concrete and finishing up the reconfigured plaza space outside of the new pool building. The facility will feature new bathrooms outfitted with showers, a wading pool/splash area, a hot tub, and a new lap pool with a maximum depth of five feet. The facility has been upgraded to cater to business travelers – particularly those seeking to swim laps or exercise in the pool – while also accommodating visitors with children and young families. An adjacent fitness center will feature brand-new aerobic and free-weight equipment. The pool and fitness center will open later than the conference center, with a targeted opening date of the third week in June. Also a part of the expansion is a new north-side patio outside the conference center that can accommodate approximately 50 guests – a space that could be used for either conference center events or additional outdoor seating for Minervas Restaurant & Bar. Surrounding the main conference center room are multiple additional meeting spaces, including a 90-capacity room, a flex space that can accommodate 50, and two smaller boardrooms able to seat 20 and 12 guests, respectively. The hallway leading to the former dome has been replaced, with the venue’s bathrooms relocated to the south of the conference center and modernized to be more universally accessible. An art and history wall near the registration/welcome area of the conference center will highlight the history of the site, including a historic marker for the former Park Place dome. Interior designer Michelle Rippentrop says the décor features neutral tones and natural elements to maintain a modern aesthetic while bringing in pops of red to reflect Traverse City’s ubiquitous cherries. Because a wide variety of groups are expected to use the conference center – ranging from weddings to private parties to national business groups – coloring in the main room was intentionally kept muted. “That way people can customize it to their needs,” Rippentrop says. The new conference center is part of a $2.6 million brownfield plan that includes $1 million for activities related to the dome demolition and expansion construction, along with another $1.6 million that will fund three public improvement projects in the coming years. Those include a new 12-inch water main servicing the Boardman/Washington/State streets area, stormwater improvements throughout downtown’s TIF 97 district, and streetscape improvements on Park Street. Officials hope the new conference center will provide an economic boost to the region. Traverse City Downtown Development Authority (DDA) CEO Jean Derenzy previously noted Traverse City Tourism receives 360 inquiries annually for group events averaging 350 attendees. The average conference attendee spends $127 a day and stays for three days. “If the new conference center receives 20 percent of the inquiries, that equates to $9.6 million (annually) for the community,” Derenzy said.